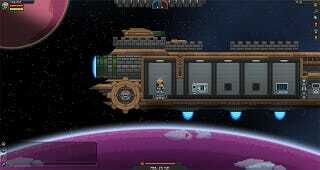 The developers of indie PC hit Starbound have had to call the authorities after it was discovered a sexual predator was using the game to "target children". "Delaying development to deal with a sexual predator targeting children", developer Tiyuri wrote on Twitter yesterday. "Just in case anyone is wondering". Starbound's Molly Carroll provdied a little more detail on the game's reddit, writing "The person in question has been permanently banned and we're looking into how to proceed re: involving authorities. To clarify, it's not a serious 'We're delaying the game!' sort of deal, but situations like this do distract from actual game development." She adds "There are a lot of underage people on our forums. If someone is messaging you in private in a way that's making you uncomfortable (especially in a sexual way), you can always message me or another staff member and we'll look into it and handle it."